Did you go to the beach this summer? Did you kids bring home buckets full of sea shells, even the broken ones? Does your book shelf look like mine? 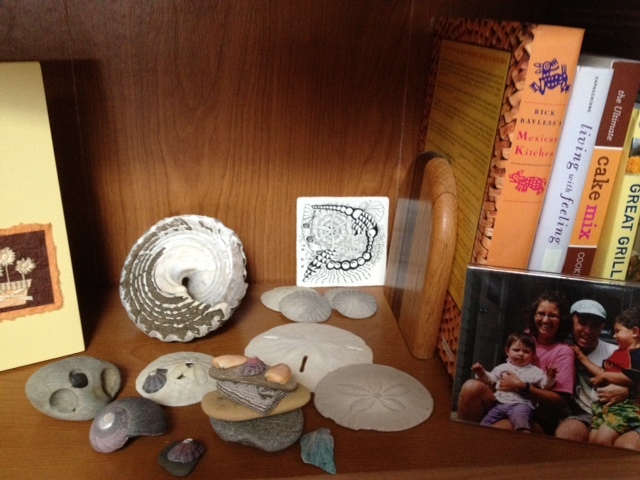 Only the nicest shells get a place on the book shelf, the rest our outside in the garden and that pile is growing quickly. Here’s another shot of some we collected recently that were washed and laid out to dry in the sun. All these beautiful colors definitely make me think about fun sea shell crafts I have done over the years! I moved to the beach this summer. We now live in Goleta, CA just outside Santa Barbara. We go to the beach frequently. 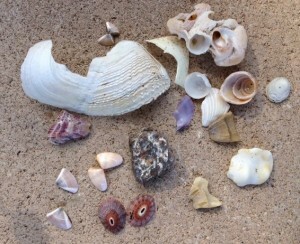 Sea shell collecting here isn’t great most of the time, but my daughter has managed to accrue quite a collection of odds, ends, bits and pieces of colorful shells. I tend to focus on the whole ones but am just as tempted as she is to pick them up and bring them home. I need to convince her (and myself) that it is okay to pick them up, admire them and then put them back on the beach for someone else to enjoy or take home! Or that if we take them home, we need a plan for storing them or using them in a craft project. Here are some ideas for sea shell crafts to do with kids using that bucket-load of shells you brought home from the beach. For all of them, the main ingredient is sea shells and your hot glue gun. Nothings gets me excited quicker than getting the hot glue gun out, does that make me weird? Hmmm, don’t really care. 1. Make a picture frame. I love those wooden frames at Michael’s, you can often get them for a dollar. You can paint the background first or paint it with glue and dump some of the leftover sand from the bottom of your suitcase onto the surface, you know there is lots in there! The key to success here is using good glue. A hot glue gun is perfect for this project. 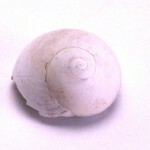 Since most kids want to do it by themselves, collaborate by allowing them to place the shells and then you glue them on. You can cover the entire frame or decorate corners, sides, whatever your little crafter has the patience for. 2. Make a refrigerator magnet. 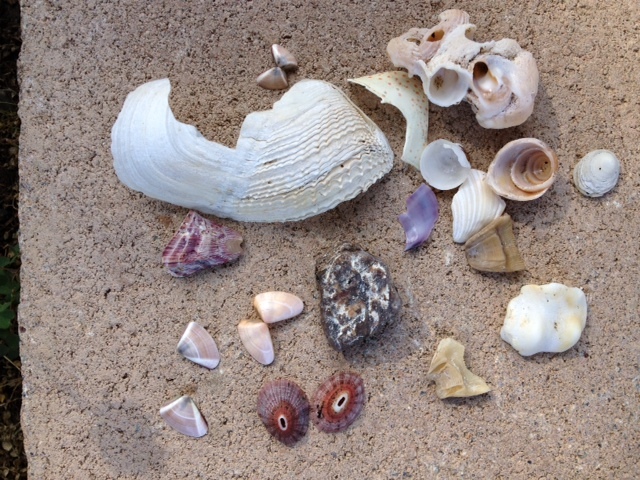 Let your child pick a couple of their favorite shells from your trip (or rocks – we always bring home too many rocks, much to my husband’s chagrin) and hot glue a magnet to the back. Use them on your refrigerator or white board as a visual remind of your trip. 3. Make a pen or pencil holder. Use a recycled tin can, make sure you file down any sharp edges and remove the label. You can paint the can with acrylic paints or leave it unpainted. You could line the inside with felt to give it a nicer touch. Cover the outside with a variety of sea shells or make a pretty patterns. Did you know you can make flowers, bugs and all kinds of great shapes out of sea shells? Do you ever think you are pretty clever and then find someone else’s idea that is way more clever? That is how I felt when I found this cute craft. Probably should have looked for images first… Oh well! This idea was more complex but I love the look of this one from HolidaysCentral.com. Here are the instructions for this one. 4. Make a Memory Box. Kids adore boxes, have you noticed that. Big ones, small ones, any size box is instantly converted to a treasure chest. 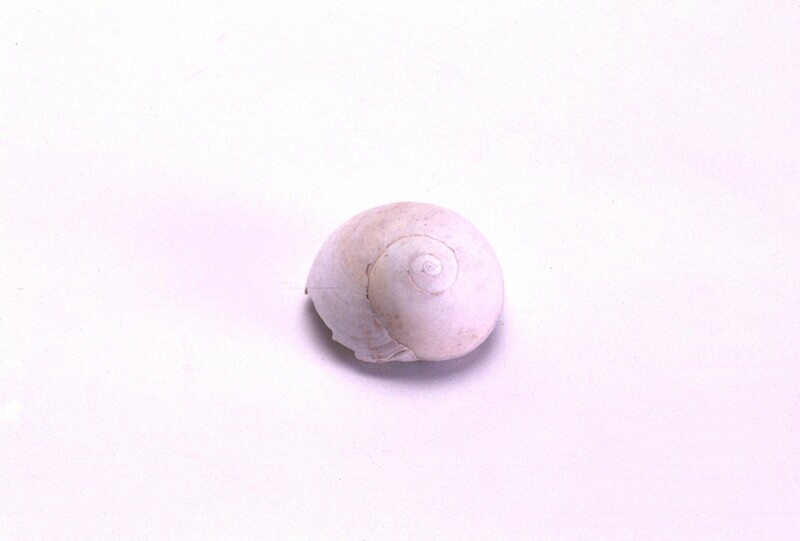 Depending on how many shells you have, visit your craft store and pick out a cardboard box (or let your child choose.) I recommend painting the box to make it last longer. You can use gesso for a good base coat and leave it white or add color on top of the gesso. 5. 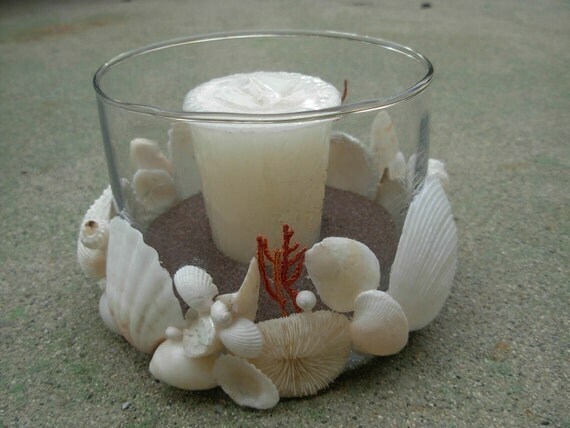 Make a shell-covered candle holder. It’s way better to use those shells for a fun craft than to have them cluttering up your closets, bookshelves or the top of the kids’ dressers, right? Plus, it’s a fun thing to do inside on a hot summer day. You can use the time to talk about your trip to the beach. Ask the kids to tell you their favorite memories of your vacation and make sure you share yours, too!